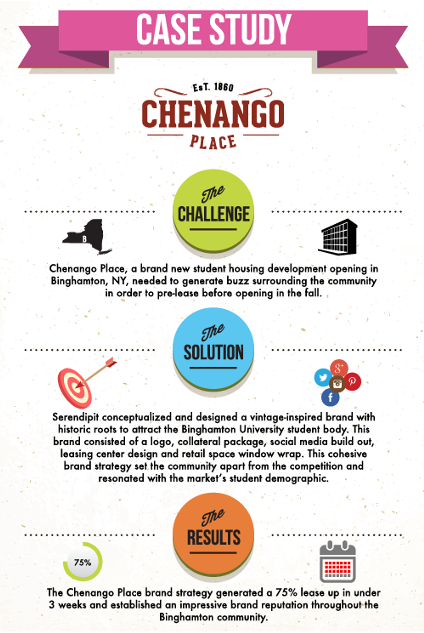 Chenango Place, a brand new student housing development opening in Binghamton, NY, needed to generate buzz surrounding the community in order to pre-lease before opening in the fall. Serendipit conceptualized and designed a vintage-inspired brand with historic roots to attract the Binghamton University student body. This brand consisted of a logo, collateral package, social media build out, leasing center design and retail space window wrap. This cohesive brand strategy set the community apart from the competition and resonated with the market's student demographic. The Chenango Place brand strategy generated 75% lease up in under 3 weeks and established an impressive brand reputation throughout the Binghamton community.